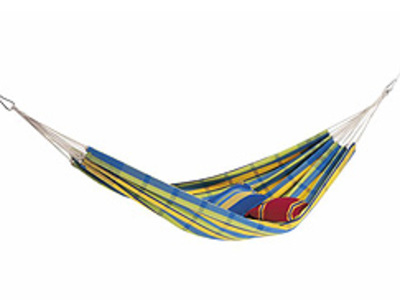 The hammock is a fabric sling used for sleeping or resting. It consists of cloth or a network of twine or thin natural or synthetic rope which is stretched between two firm points such as trees or attached to a metal or wood structure. Hammocks are widely used for relaxation in backyards, cottages, and waterfront areas, and they are carried as a lightweight type of bed on camping trips. 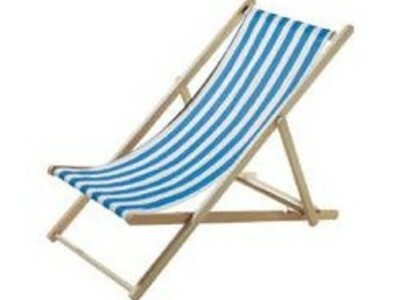 A deckchair is a folding chair with a fabric or vinyl backrest and seat. It may have an extended seat that is meant to be used as a leg rest and may have arm rests. It is meant for leisure, originally on a cruise ship's deck.